Posted November 28, 2009 by finnfemme & filed under Daily Life, Fashion, Frugal Living, Vintage. Now that the cold, damp and clammy weather has settled in the Pacific Northwest, my feet have been letting me know for quite a while now that it’s time to get out the warm socks. I have cold feet. VERY cold feet. Almost all the time except for summer. Oh blessed summer when I can wear sandals to my heart’s content; no stocking comes near me then! Fall, winter, and spring are a completely different story. My feet turn into icicles and I have to make valiant attempts to keep them warm at all costs. You see, for a couple winters in a row now, I have developed the very old-fashioned sounding condition of chilblains. Chilblains are caused by exposure to cold and humidity in susceptible people. The coldness damages capillary beds on the toes and causes swelling and redness. For a long time I never knew what the condition was, but a Google search on my symptoms turned up the correct chilblain result. What’s reassuring is the “cure” for chilblains. No drugs, treatments, or doctor visits required. Just the simple solution of keeping your feet and hands warm during the winter! For me, this has been investing in a variety of warm socks. 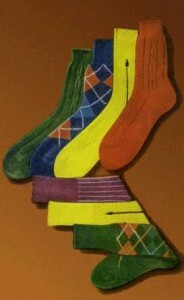 Wool socks in different weights, microfiber, cotton, angora, and cashmere socks. Also nylon and microfiber tights. I have fuzzy woolly slippers too. My feet are always sufficiently clad at all times during winter. I know now that I cannot go out and shovel snow in my rubber Wellies without several layers of thick wool socks! I made that mistake last winter during a particularly severe snow/cold snap. I was shoveling snow for days on end without enough protection for my feet, and they paid the price. So I continue to keep adding to my sock collection. Luckily there are so many fun, cute, and stylish socks out there. My feet thank me that they are being kept warm. Warm feet are happy feet…and happy feet make a happier me! Posted November 24, 2009 by finnfemme & filed under Daily Life. It was interesting to see Martha Stewart speak off the cuff the other night regarding Sarah Palin. Perhaps caught unawares, her true feelings surfaced pretty quickly. Calling Sarah Palin “very boring”, “dangerous”, and “confused”. While Martha is certainly entitled to her opinion, she came across as shrill, catty, and elitist. It’s disturbing to me to see a woman of influence treat another woman of influence in this dismissive way. Whatever happened to good manners and political neutrality in talk show hosts? What about lifting others up instead of tearing others down, no matter their political leanings? How about some tolerance and open-mindedness? Do we now have to be divided politically while we learn housekeeping hints? I’d like to see a good old-fashioned return to manners. Let’s show respect for one another, no matter our differences. You don’t build yourself up by berating others. Let’s be for something instead of against something. I’ve been a Martha Stewart fan for a long time. I love her devotion to creating a better home and a more creative life. But I think Martha needs attention in the civilities department. Manners and good words are as essential to gracious living as setting a table or cooking a gourmet meal. Posted November 18, 2009 by finnfemme & filed under Daily Life, Fashion, Vintage. Today while poking around one of my favorite thrift stores, I came across an interesting vintage-y looking pink box with graphics of lingerie. It was quite large, long and banded with two rubber bands. Part of the fun of thrift store shopping is never knowing what you’re going to come across. 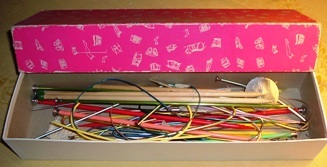 I opened the noisy box (it rattled) and was extremely pleased to find a collection of old knitting needles and crochet hooks. Large ones, small ones, wooden ones, metal ones, curved ones, and loopy ones. A lifetime of handcraft tools all in one box. I do knit and crochet, but am not actively pursuing this hobby at the moment. It’s something that I always do come back to from time to time. I enjoy the familiar and comforting rhythms of clicking needles and handling yarn. It alternately focuses the mind and allows it to wander at the same time, while producing a work of art. There is something about using needles and hooks passed along by someone else. I wonder how many sweaters and scarves were lovingly knit with the needles over time? I’m sure a certain energy is passed along after all those hours spent in industrious hands! 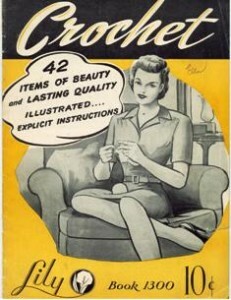 I enjoy vintage knitting and crochet pattern books and buy any that I happen to come across. The patterns are incredibly lovely, intricate, and often amusing too! How about making a pair of 1940s “Loafer Espadrilles” house slippers, or a “High Chair Doily” for elegant baby dining? (I have the patterns!) I am often amazed at how much work was put into making such household items. I love collecting this aspect of vintage womanly arts. Now that the cold winter wind is a blowin’ and I’m cuddled up warm inside, I think it may be a good time to pick up the needles and start a project. I do have a stash of vintage yarn (I collect that too), the patterns, and many types of knitting needles, so I have no excuses. And a pair of Loafer Espadrilles does sound quite fetching! Posted November 14, 2009 by finnfemme & filed under Fashion, Vintage. I am a big fan of old-fashioned bar soap; those hard milled, dense bars that smell of some strong floral combination. Yup, love it! The trend now is for liquid body washes to be used with those ghastly nylon scrubber things. It’s rare to see a bar of soap in a soap dish in the bathroom anymore. There are still bar soaps out there, to be sure. But most times they are some gelatinous brightly colored glob that dissolves almost instantaneously. It’s hard to find the old time stuff; the kind that was always present in every vintage bathroom soap dish. 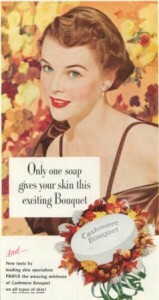 I mean, really…who wouldn’t want to try bar soap after all those promises, vintage or not? Just wash your face or take a bath with it, and presto…instant allure that no man will be able to resist! I’m always looking for the old-time soap, and find it from time to time in interesting places like rummage sales and thrift stores. I recently found a box of vintage thick, sturdy, tuberose scented French milled soap. No doubt it was probably given as a gift, and then donated (I’m always grateful to those who donate). The bars are just so solid, and the scent is divine. It really makes taking a shower a lovely experience, and the bars seemingly last forever. The scent of these vintage soaps is what gets me. Such poignancy that touches some memory in the recesses of my mind. The feel of the delicate lather gently cleaning, the softly scented skin as a result. Just lovely. Maybe those vintage ads are true! Posted October 29, 2009 by finnfemme & filed under Fashion, Vintage. My friend and fellow vintage eBay seller, Bobbi, dressedtothe9s, uses live models for her auction listings; something that I’ve never done! So I am going to let her tell you, as a guest blogger, how she does it so fabulously. Take it away, Bobbi! The discussion has been held, many times, about the benefits of taking pictures of your clothes on a live model vs. a mannequin. Everyone has an opinion, and when it comes down to it, the choice is yours. Personally, I have a mannequin named Goldie that I love! I use her almost exclusively for my older, more classic vintage from the 30s thru early 60s. She has a gorgeous figure, doesn’t talk back, is always on time, stays still when I tell her to, and most importantly: she never has a blemish! However, I prefer to use live models when I am photographing trendier items from the mid 60s thru late 80s. A model can show the movement and flow of an item, but more importantly, she can make a personal connection with the buyer and showcase your item to its higher potential. Ever tried to show the beauty of a kimono sleeved jumpsuit with palazzo pants, on a mannequin? So, if you are interested in the ins and outs of working with a live model, I would love to share what I know. Where to find a model: The first thing that I do is post an ad for a model. Be as specific as you can, in regards to height, weight, size, hair color and age. Give a brief description of the job (example: online vintage clothing sales) and ask that they send their information along with at least 2 pics to you via email, including full body and face shot. Ask for unedited pictures! When I am ready to start my search for a new model, I post on craigslist, do a model call on my myspace, and print off flyers and post them at local coffee shops, junior colleges and community bulletin boards. Its always nice to ask neighbors, friends and family. I keep business cards on me at all times to pass out, and found my last model working behind the counter at Office Max. Meet and greet: Once you have narrowed your search down, I set up a day to meet with potential models. For this first interview, I invite either a parent or friend to come along, just to make the girls feel a bit safer. There are many predators advertising for models and it is important to let them know that you are on the up and up. Have your camera ready to take a few candid shots of each gal and I like to keep a notebook handy to jot down comments once they leave. Chemistry is so important! No matter how pretty a girl is, if you don’t like her personality, or she doesnt take direction from you, it will not be a good working environment. Remember… this is supposed to be fun! Compensation: What to pay? I know quite a few sellers who use models and we all do it different. You can pay by the hour, trade, or pay by the piece. I pay my girls “per-piece”. It is good incentive for them to change quickly, take direction and move onto the next piece. Trade is always an option with my girls too, but I do it at the Per Piece ratio. X amount of value on a dress, means she owes me X amount of pictures. The Shoot: I like to work with 2 models at the same time. My gals have been together for a long time and we all have a great time! We spend about 15 minutes going over the items, and then we divide the items between them. While one of the girls is shooting with me, the other one is getting ready. As soon as one girl is done, the other model gets in front of the camera. I never leave my spot and the inventory is constantly rotating and changing. When they are getting paid per item, they appreciate how fast things move along. Organization: This is probably the most important issue to have a productive/fun shoot! I categorize my shoots with different racks, each one with the appropriate boots/shoes. I do all the dresses with black shoes first, boots next, flats, etc. Keep a box of accessories close at hand, with belts and clasps that may be needed to pin an item to a model. Bottled water within reach is necessary for the models. It gets hot having so much fun! Picture Review: This is especially important for the first few times that you use a new model. I find myself saying “give me right shoulder”, “stomach in”, “kick back your leg”m, “pivot your knee”, alot! You want a girl that can take direction, but more importantly, you need to SHOW her WHY you want specific shots. Sit down at the computer after a shoot and you will both end up giggling at the funny faces, bad posture, flailing arms, etc. A constructive critique between the two of you will make her understand what you want. I try to focus on the GREAT shots and point out the things that I like, and they listen and learn. Editing: After my pictures are edited, I upload them to my pictures on my myspace, into the models specific folder. They are welcome to copy the pictures and to use them on their own sites, be that facebook or myspace. I also have small Moo photo business cards with pictures of my models, and I present all of them with a card holder that has pictures of them on the front, and my business information on the back. In closing: Working with a live model is so much fun! I have become best friends/den mother with all of my models and am still in contact with every single one. 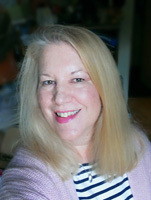 I hope that my influence in bringing out their beauty and showcasing them, along with positive motivation from me as an older woman has enhanced their lives. I know that their connection to me, has enhanced mine! Posted October 19, 2009 by finnfemme & filed under Daily Life, Fashion, Frugal Living, Vintage. I am the ever-practical environmentalist; doing all that I can in my daily life to keep the earth a little greener. Most notably in my laundry practices. I’ve been air-drying exclusively now for about four years; ever since my dryer refused to heat. It makes my life easier (really! ), my utility bill is down about 15%, and I don’t have the added worry of a possible dryer fire. 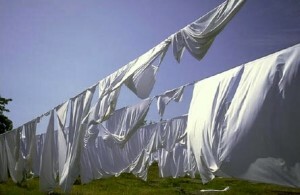 While I could feel some smug satisfaction with the energy and environmental saving aspects of using a clothesline, I still continued to regularly use warm, and sometimes hot water to wash my laundry. I think it was a combination of “it has always been done this way”, and the thought that my clothes would not get clean in cold water. I think it’s been pounded in our collective brains over the years through advertising, and yes, from mom, that warm and hot water washes are “the way” to go. You don’t want creepy crawly bacteria or other horrifying creatures crawling on your clothes do you??? This summer I decided to “Go Cold”… all the way, baby! The temperature setting on my washer is now set on cold, and hasn’t budged. I wash everything in cold water. Yes, even sheets, towels, and underwear. Amazingly, everything comes out extremely clean. The whites are brilliant, and the colors aren’t faded. I am almost convinced that there is some kind of super power in cold water! No heat at all is used in my laundry practices. Cold water wash, and then straight to the clothesline or drying rack. I rarely, if ever, iron – so no heat from that either. Hang-drying leaves clothes perfectly pressed. The life of my clothes will probably be extended indefinitely! This is good because I love my clothes, and wear a lot of vintage clothing too. These days I guess I could feel a bit smugger, knowing I’m about as green as you can get in laundry practices. But I’m not a smug person. I do get a feeling of satisfaction and yes, joy, from doing things this way. Now THAT is a good feeling!